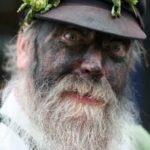 Tradition has it that the first English hop garden was created near Canterbury in 1520, as Kent was the earliest centre for hop culture due to its suitable soil, established enclosed field system and good supply of wood for the poles and charcoal for drying. Furthermore, Kent farmers could afford the high initial capital outlay as they were among the most prosperous of the time. 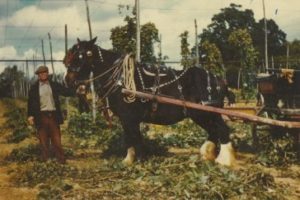 One of the simplest and most economic methods of training hops was developed in Kent by Henry Butcher in about 1875. 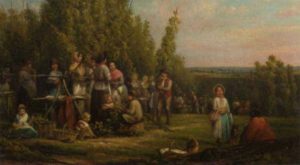 A great deal of manpower was always required in all hop-growing regions of England to pick the hops in September, as the value of the crop depended on it being picked quickly and at the right moment. Kentish records of the mid 17th century mention some ‘strangers who came a hopping’ indicating that there was not enough local labour. The majority of Kent’s manpower came from London and at the industry’s peak, more than 80,000 people poured into Kent every autumn. 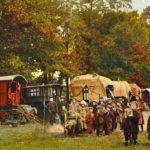 Traditionally, a family of two adults and three children earned about £3 per week and might take home £10 to £15 per week as living expenses were low, with shelter and fuel provided. One condition of employment was that the hoppers must stay the full harvest term and some pay was held back until the work was through. 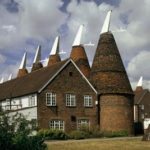 Between the wars, East Londoners regarded the picking season as a holiday with pay as they got to exchange their cramped town life for a month’s rural freedom and whole families were known to visit the same Kent hop yards for several generations. 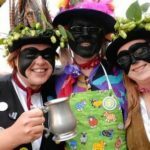 Continuing to celebrate the family and community tradition of hop picking in Kent, is the Faversham Hop Festival, which takes place in the medieval town of Faversham each summer and commemorates the golden days of hop-picking. 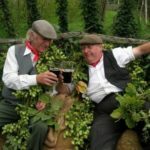 The more American brewers learn about hop terroir, the more they appreciate the different character British hops express in their beers – whether they are using Old World varieties or ones as fashionable as any from the New World. Authenticity has become a rallying cry for American brewers who understand Old World inspired beers should be made with Old World hops.